This review originally appeared on A Photographer Afloat on 18th October 2018 and has been republished with kind permission. For more articles about paddling and photography, visit A Photographer Afloat. For a long time now, I have been looking for an easy solution to the problem of doing an unsupported on-way trip, and still ending up reunited with my transport. Inflatable or folding canoes tended to be bulky and heavy. Various ideas came to mind, but with a hard shell canoe, the only solution I could see was to buy, make or adapt a trailer to tow the boat behind my bike. Trailers do exist, but are quite expensive, would occupy a lot of room in the boat, and realistically limit the cycling part of the journey to rods and level tracks. I wanted the freedom to do more! Blogs on the Song of the Paddle pointed me in the direction of packrafts. These are lightweight inflatable boats, specifically designed to be compact and easy to carry in a rucksack or on a bike. At first glance they look like odd-shaped beach toys, but perform like ‘proper’ boats. So after a lot of research, I took the plunge, and ordered a DE260 packraft from Longshore International, a UK-based firm. Their website is very informative, and gives easy access to all the specifications for the models they sell. I went for this one because it was a good compromise for what I wanted to do – single and multiple day trips, on foot or with the bike. Longshore packrafts are a bit heavier and bulkier than alpaca rafts, which use a lighter single-coated fabric for their hulls, but these things are relative. The DE260 weighs in at around 4.5kg with all the attachments, compared to around 3kg for the alpaca llama, but it is significantly cheaper, and comes with a removable cruiser deck, a nice refinement for colder or wetter days. The cockpit is slightly longer too, which suited me. Service was excellent – I ordered via their website yesterday morning, and had an email from Tim, the owner of the company, confirming dispatch that afternoon. The boat and four-piece paddle arrived this morning. The boat-in-a-box contained the boat itself, the deck, a repair kit and spare valve, an inflation bag and a storage bag. The inflation bag simply screws into the valve, and you squeeze air into the hull. It took me more than the advertised three minutes to inflate – there is a knack to filling and closing the bag, but it doesn’t take long to get the hang of it, and Im sure I will be quicker next time. Hull pressure was topped off by inserting the second part of the valve and using lung power. The seat and back rest are also inflatable, and seemed quite comfortable . The cockpit felt a bit smaller than the specifications suggested, but still had ample space for me. I would be able to fit a day-sack ahead of my feet without a problem, though larger loads would have to sit on top of the bow tubing. However, there are tie-downs specifically for this both on the bow and stern. The cruiser deck was easy to fit with a combination of two zips and a velcro strip. 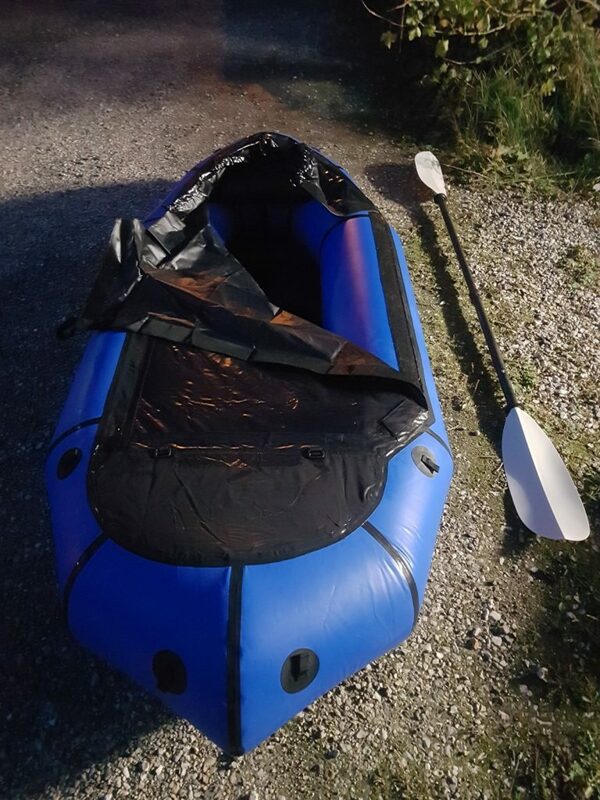 It has an inflatable panel to reduce pooling of water round the paddler’s waist, and looked like it would cope with moderate splashes easily. It was also easy to pull off to exit the boat, with a grab loop of tape on the left side. The whole deck can be stowed as a roll at the bow should you want it available but not in place. The final touches were to add short grab loops of cord to bow and stern. The boat doesn’t have any handles, so these will make it much easier to hold onto when launching/recovering. That has to be the quickest bit of outfitting I have ever done! It was now too late in the evening to hit the water, so all that remained was to deflate my new blue ballon and pack it away. 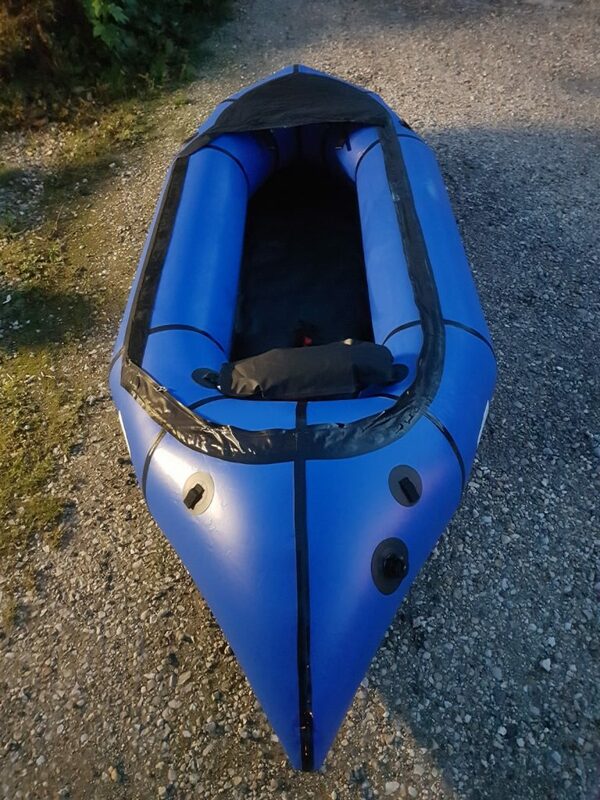 This was very easily done – simply deflating the seat and backrest, then unscrewing the Boston valve at the stern and rolling the boat up to deflate it. I decided to leave the deck attached, so this and my inexpert folding gave me a slightly bulkier package than had arrived, but it was still impressively small, and fitted easily into the supplied storage bag along with the spare parts and inflation bag. Even the paddles packed down to a size that would fit in a rucksack. For more articles about paddling and photography visit A Photographer Afloat.